It wasn’t sheer generosity that prompted players on the Norwegian men’s football team to turn over some of their pay to players on the women’s national team last week. The head of the organization representing them also credits outspoken star player Ada Hegerberg, who got so frustrated at how the women’s squad was managed that she withdrew from it. Norwegian Broadcasting (NRK) reported on Friday that the men’s and women’s national football teams will have the same economic framework from January 1. That’s never happened before, even in otherwise egalitarian Norway, and the men’s team players got much of the credit. 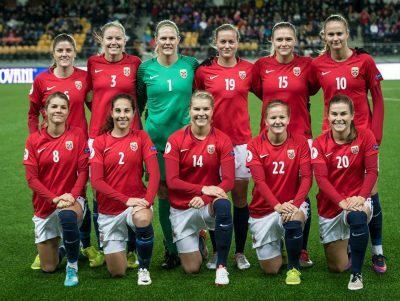 They declared they were willing to take pay cuts as long as Norway’s national football federation NFF transferred the money saved to the women’s team. At the same time, NFF will augment the women’s team’s budget. “It’s an investment on the part of NFF so that the women’s team can hang on,” Joachim Walltin, leader of the players’ organization NISO, told NRK. It negotiated the new agreement on behalf of both the women and the men. Hegerberg has grabbed a lot of attention during the past year, especially after she became the top scorer in all three seasons she’s played for the major French club Lyon. It in turn won the Champions League the last two years in a row and last summer, Hegerberg was named as the best women’s football player in Europe, sharing the stage with Cristiano Ronaldo. Sponsor interest in Hegerberg soared along with her goals but she got fed up with the performance and management of Norway’s landslag last summer. That stunned NFF officials who could hardly believe she’d storm off the field. It also means they potentially lose sponsor interest and income that Walltin said has “exploded” for top women players recently. “The women are being used more and more in sponsorship campaigns and must get their piece of the cake, too,” Waltinn said. There’s been a lot of disgruntlement with NFF in general lately, with its leaders subject to massive criticism. The women players’ new deal with NFF nearly doubles their national team earnings. Ironically, Hegerberg won’t benefit from the raises since she’s not playing on the team at present. Her former teammates appreciated the pay hike as they now head into new qualifying rounds for the next World Championships.